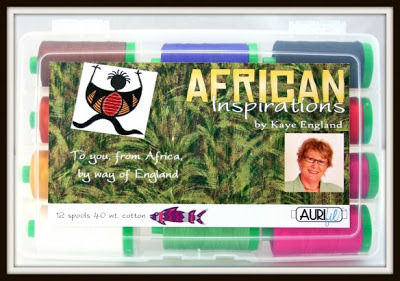 This sew full of thanks giveaway is sponsored by the fabulous people at Aurifil Threads! One set of 12 spools will be coming home to a lucky winner! Aren't the colors gorgeous?! Have you ever sewed with Aurifil thread? It comes highly recommended across the blogosphere. I won a set of four spools of neutral thread in the Beginner's Quilt Along at the Quilting gallery - thanks for your votes, by the way! I haven't been able to test them out yet, but don't worry! I'll be back with a review for you soon! more thread on your bobbins! always a plus! If you'd like to read more, amy at badskirt has a good review, and there's a cost breakdown at live. love. create. I did a little looking online, and Red Rock Threads has some pretty good deals on sets. I generally use white, tan, or gray thread, so it just makes sense to buy large spools of those colors, and not have to rethread my machine as often while working on a project! Giveaway will close 11/19/2012 at noon CST. Winner will be notified by email, and has one week to claim their prize. More giveaways still to come! check back soon! I have just gotten some Aurifil thread and have used it for EPP (amazing!!! no tangles! ), but I am in the middle of machine-piecing a quilt and didn't want to switch thread halfway through. I cannot wait to use it on my machine! Not yet! I do have a few mini spools that I won but they're bright colors so I'm waiting for the perfect project! I love Aurifil thread - it makes a big difference when I'm doing teeny tiny foundation piecing! These colors are fabulous! Thanks for hosting this give-away! So far I haven't tried Aurifil but I would really like to! I've used Aurifil on my last few quilts and have loved working with it, I'd love to boost my collection with these! Thanks for the give away! Aurifil is my go to thread. Even verigated is the best ever! I use Aurifil gray thread for everything. No but I'd like to!! Not yet but really need some new thread so would be happy to try it! I love it! Especially the bobbin capacity! I haven't tried the large cones, but I have been thinking about getting a thead stand so I can! I have just recently tried it for the first time, and I'd like to get some more colors! I haven't tried it yet, but I have a few rolls that I been saving for the right project. I think I just need to break them out and try them already. I would love to try these threads. They look delicious. Thanks for sponsoring a giveaway. I have never used Aurifil before but am looking forward to trying it. Those colors are beautiful! I love to use Aurifil for piecing as well as quilting. I've tried a couple of colors, but would love to win some. Love aurifil threads...I use them all the time! Yes, I have a couple of mini spools and love them,especially because they don't fray like my usual thread!! I use Aurifil and LOVE it. I accidentally started with another brand on yesterdays big project and my machine was a linty mess! I woudl love the gorgeous colors in the giveaway! locally, and would love to have some. 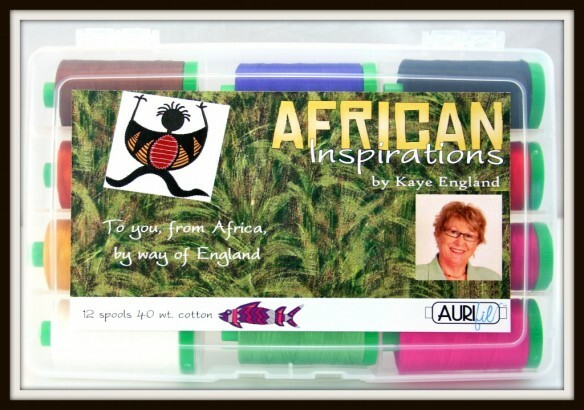 I have read about Aurifil and would love to win some. It's not available locally here either. I have some sample spools, but I haven't used them yet. Thanks for the giveaway. Not yet, but I love the colors. I've used it for a bit of machine sewing and a bit of hand sewing, my machine hasn't figured out if it likes it or not yet! I love it for machine piecing and the lana wool for decorative stitching. I haven't tried Aurifil thread, but I would love to...just can't seem to win any. I have been trying for awhile now. I've never used it, but I'd like to try! I like Aurifil thread. I think it sheds less than other threads do. I have never used it, but I'd like to try it! I have only used it once and loved it, would like very much to use it more often. I don't buy anything but Aurifil! Thanks for the great giveaway! 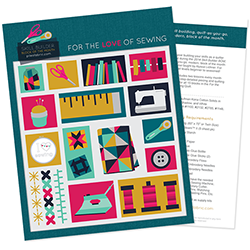 I've never used Aurifil before but would love the opportunity to sample such a great project. I would love to try Aurifil, I heard nothing but good things. Haven't used this particular thread before, but would love to try it! 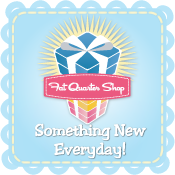 I am a beginning quilter, so it would be really nice to have such a colorful collection! Aurifil is my FAVORITE THREAD! It is all I ever use for piecing and use it a lot for quilting, too. It is just THE BEST! It runs through the machine nice, and it lasts a long time! I also buy it from Red Rock Threads all the time. Those guys are the best. They ship so fast, and their prices are good! Nice to visit, Tammie! Hope all's well! Would love to try Aurifil, and love the colours in this set. Thanks for the chance! I've just started using Aurifil recently. My machine loves to FMQ with it, and it is so smooth for hand stitching. But I only have white and cream at the moment. I love aurifil but can't seem to find it locally. It's harder to buy it online and have to pay shipping! I'd love to, but not had the chance yet. The palette of colours looks amazing. What a fantastic collectin of colors! I haven't jad the pleasure of trying aurofil yet; they sell a lot of Gutterman where I live. I sure had heard the raves though! Those are some seriously delicious colours! I'm an Aurifil addict! I have not used Aurifil yet, but I think I might try it next time. A lot of people seem to like it. I have some Aurifil thread that I plan to use in my mid arm quilting machine; but, it will be awhile yet before I can get to the project due to the fact I am still setting up house! (unpacking). I use Aurifil often. Thanks for the chance to win ! I think aurifil is wonderful and would love to win. I've tried it with EPP and in my machine. I've used Aurifil thread with my Hawaiian quilt based on the recommendations of Nancy Chong of Pacific Rim Quilts. It was great! I would love to try aurifil. Thanks for the chance. The colors are wonderful! I have used Aurifil thread for a little while now and it is marvelous. It leaves little or no lint in my machine and loads my bobbins with lots of thread. I bought some Aurifil thread online as I couldn't purchase it here in PE, Canada. I love the thread, it's practically lint free and I really am impressed with how much I can load on the bobbin. Would love to purchase more in the future.Would really like to win some as well. Thanks. I haven't used it but i would love a chance to! Beautiful colors! I have one spool of tan and a small white one. I love it so far and would love to win the thread set! Aurifil is my my favorite thread for quilting! I have never sewn with Aurifil thread so would love to win so I could try them. So many use them. Yes I have used them, not for the usual projects thou. I love to cross stitch with this thread it is just gorgeous. I have used Aurifil 50 wt and it is fabulous. My Bernina loves it and it leaves no lint. I have not tried it yet either. 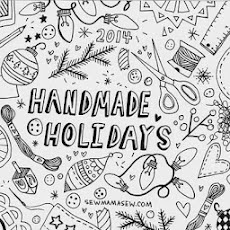 I won a sampler pack and I am about to try it on a Christmas project. I am anxious because it feels dreamy. I splurged and tried one neutral colored spool of the Aurifil thread for hand piecing and I have to say it is the best thread I have ever used! I would love to win other colors and this collection is just beautiful! I have just started using my first spool on an embroidery project I am doing. I haven't used it for quilt piecing yet. Beautiful thread!!! Preforms like liquid gold, beautifully!!! Comes in beautiful colors!! Highly recommend it. I haven't used Auriful yet but I want to. i♥aurifil! and these are fabulous colors! thanx for the chance to win them. I love Aurifil Thread! And love the colors in this collection! 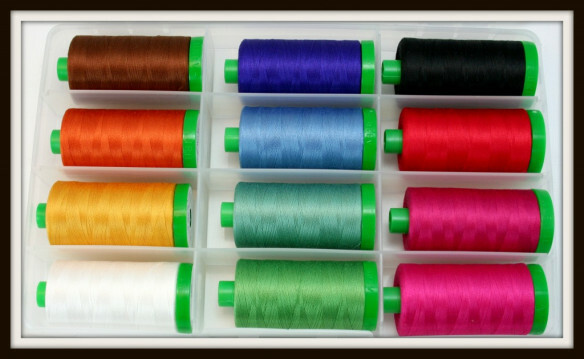 We love Auriful threads at Auntie Ju's Quilt Shoppe! No, I haven't tried it yet but I would love to! I love Aurifil thread!! It's really the only thread my Pfaff likes! I have zero breakage or skipped stitches when I use it! I have only one spool of Aurifil thread, a varigated yellow I'm using to machine quilt a bed runner. You can see the difference it makes using quality thread! I have used it a couple of times to quilt. Really great thread! I need more colors! I have Aurifil thread and just love it! I have used it for machine quilting, piecing, and completely fell in love with it for hand sewing the binding on! I've used the wool thread too--and it sews just wonderfully!! I have a few more spools of another brand--and once they are gone--I'll use Aurifil 100% for everything!! And another bonus.....no lint!! My local quilt shop carries this thread and I absolutely love it. So many color choices and the quality can't be beat. I bought some earlier this year and love it, have been using for all my piecing and quilting ever since! I won a few spools about a year ago, and just love them. 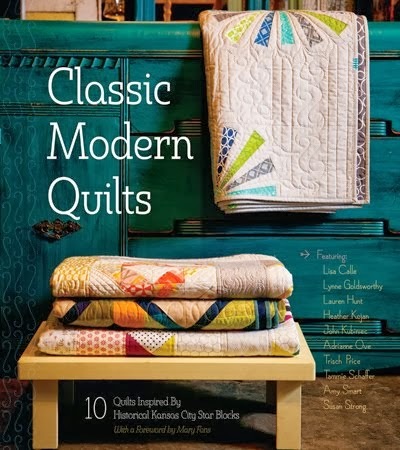 I bought more at a quilt show, and would love to win some more! I haven't tried Aurifil thread and want to win some so can try before buy. I've heard exceptional praise for Aurifil thread for piecing quilts and machine quilting too. i've only used the 50 wt thread from Aurifil and i love it!! would love to try there other products. I do love Aurifil for piecing, free-motion quilting and for machine embroidery. Great quality and color selection...just wish I had more colors and the colors in this kit are BEAUTIFUL. Would love to create with them. yes, I have used Aurifil. It is beautiful thread and this is a beautiful collection. I love the fact that Aurifil thread is nearly lint free! Other threads really load up machine, but not Aurifil! Thanks for the chance to win! MY LQS is finally carrying it so I just bought my first spool. It will be tested right after I get my shower this morning. I am super cheap, uhh, I mean thrifty, so I have never used Aurifill. but I'd love to try it out!! I've never tried it, but would be happy to. I haven't tried Aurifil. If I don't win, I think I'm going to have to buy a spool. No, I haven't. I can't afford it. nope not yet! have not come across it out here yet! Love my Aurifil thread. Thanks. I have heard SO many people talk about aurifil. I would love to try it! Yes, I have tried Aurifil thread but I don't have any of those really exciting colours. Like you mine are the dull everyday usuable kind. The thread sews like a dream.